When you're thinking about your next driver—and we know you are, probably right now—what's increasingly different in 2018 is how the universe of drivers is expanding to meet your demands. Whether it's more adjustability than you could possibly imagine, or maybe none at all, the driver should be golf's most personalized club. Our 2018 Hot List roster of drivers makes the divisions in driver types—and personality types—more clear than it's ever been. There are drivers for those who sense every subtle change of loft and face angle and center of gravity—or, more importantly, want to. 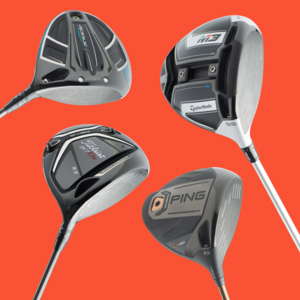 More precisely, these are the kind of drivers for golfers eager to experiment with change, or at the very least eager for their fitter to spend time dialing in settings that will optimize their tendencies. Even more than that one-time fitting experience, these drivers with multiple levels of adjustability literally grow and change with you as your game changes. They can manage your old move or help groove a new one. With three or four degrees of loft change and ballflight tweaking from draw to fade, all on the same head, these drivers let you find you—and most likely more fairways and shorter shots into the green, too. And with multiple materials, including lightweight composite panels and business-card thick titanium alloys becoming more prevalent, all that saved weight is helping these drivers with multiple adjustability not forego forgiveness in higher launch and off-center hit performance, too. But there is another movement in drivers, too. Even on the PGA Tour, there's a quest toward simplicity. Heading into 2018, there are more players using drivers on the PGA Tour that don't have movable weight settings than do, for example. This class of drivers are perhaps less like quarterbacks and air traffic controllers and more like high-speed, freak-sized edge rushers and jumbo airliners. They have large footprints, plenty of face area and generally lighter weight. It's all in the name of making your ball and you go faster. In short, a trip to Pound Town without the need for directions or GPS. Without movable weights, these drivers still often provide the chance to adjust loft and face angle, and they will offer bonus models that might tackle lower spin specifically or, most aggressively, will go after the slice (and between us, those draw-biased drivers should be high on your consideration set unless you've got your name on your bag). And everywhere from overall clubhead stability to non-traditional face designs, today's top club engineers are finding new secrets to show you straighter shots. Drivers have been powerful for a long time, but the best new entries on these pages are putting the reins of all that horsepower securely in your hands.